2. Cruise control / speed limiter switches. 3. Lighting and direction indicators control stalk. 8. Side adjustable air vent. 9. Glove box - Audio/video sockets. 10. Storage compartment with net. 14. Heating / air conditioning controls. 15. Audio and telematic system. 1. Wiper / screenwash / trip computer control stalk. 2. Audio and telematic system steering mounted control. 3. Steering lock and ignition. 8. Front armrest - Peugeot Connect USB and/or JACK auxiliary socket. 9. 12 V accessory socket. 10. 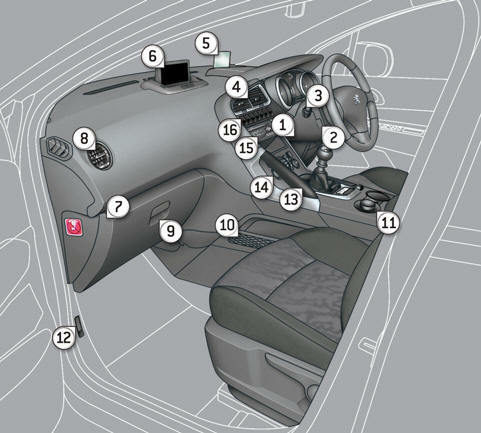 Driver's storage compartment (Handbook). Dynamic stability control switch (ESC/ASR). Stop & Start deactivation switch. 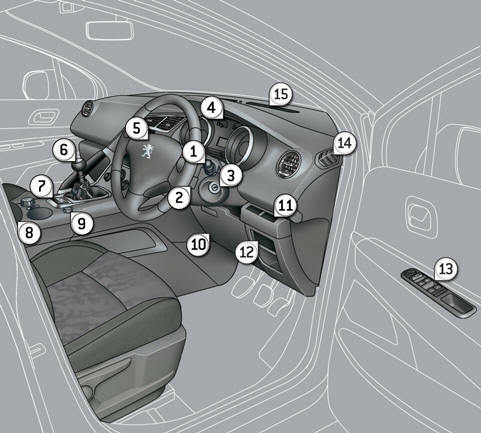 Instrument panel navigator associated with the Peugeot Connect Media Navigation (RT6). 14. Front side window demisting vent.